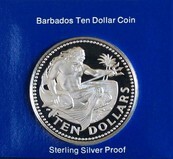 Barbados, Ten-Dollar 1974 Silver Proof FDC. 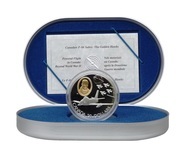 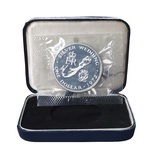 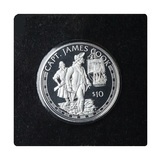 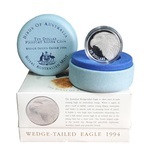 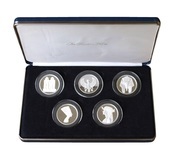 Minted by the Franklin Mint in Sterling silver Proof, encapsulated within card. 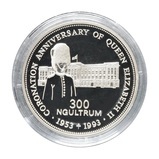 Cayman Islands, 5 Dollars 1993 Silver Proof, Rev: 40th Anniversary of the Coronation of Queen Elizabeth II. 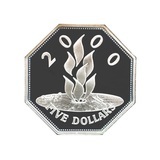 Cook Islands, 1974 Silver Proof 50 Dollars, Commemorating The Centenary of Sir Winston Churchill, "Man of the Century"
Djibouti, 100 Francs 1994 Reverse: Frigate "Bateau" Silver Proof FDC in Capsule. 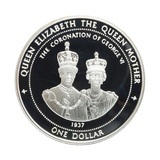 East Caribbean States, 10 Dollars 1993 Silver Proof, Rev: 40th Anniversary of the Coronation of Queen Elizabeth II. 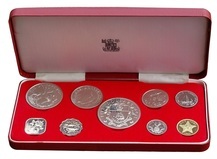 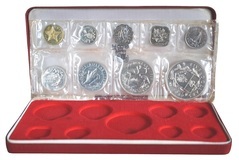 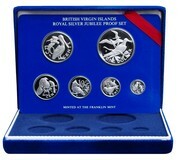 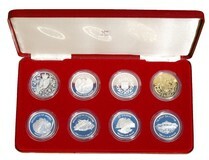 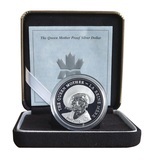 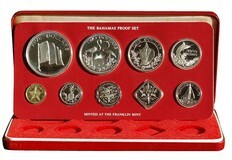 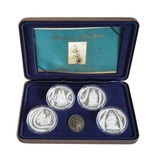 East Caribbean States, 5 Dollars 2012 Silver Proof, Rev: 60th Anniversary of the Coronation of Queen Elizabeth II. 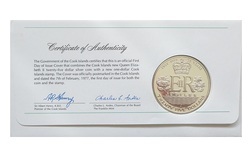 East Caribbean States, 5 Dollars 2013 Silver Proof, Rev: 60th Anniversary of the Coronation of Queen Elizabeth II. 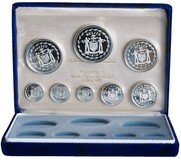 Egypt, 5 Pounds 1994 Silver Proof FDC in capsule. 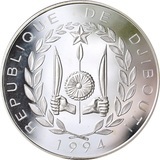 Ancient sailing boat of Queen Chnemtamun. 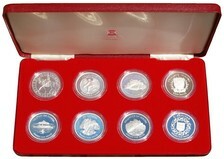 Egypt, 5 Pounds 1999 Official Silver Proof (Five Coin) Collection FDC.